Previously, on MinerBumping... After weeks of having their mining operations shut down by the New Order, Mission Ready Mining corp was out of ideas. With the return of Agent Kalorned to the Gelhan system, it seemed that a new era of Code compliance was about to begin. On occasion, miners not affiliated with MRM wandered into Gelhan to mine without a permit. Punishment came swiftly--sometimes within seconds. Not all of the locals were hostile toward the Code. By now, they simply accepted it as a fact of life. Anyone who tried to mine without a license was a fool. Klown Richness was sore about losing his Mackinaw and pod. Kalorned and his fellow Agents didn't waste the opportunity to make an example out of the miner. The miner appealed to the mercy of Goons. Remember when Goons were thought of as the "bad guys" of highsec? Now they're seen as the reasonable alternative to the New Order. At least the Goons can be negotiated with, reasoned with. 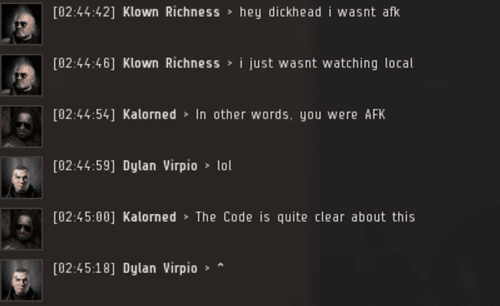 For a brief moment, Klown suggested he might be entitled to some privileges associated with having powerful friends/alts in nullsec. No, the miner had to obey the Code. That was his privilege. Things had changed in Gelhan. It was clear that no resistance movement was going to get anywhere. Klown wasn't interested in teaming up with fellow unlicensed miners; he'd rather watch them suffer as he had suffered. At least then he would be entertained. And so the Gelhan system experienced a new phenomenon: Collaboration. Agent Kalorned ruled the system with an iron bump. He was so skilled at bump-tackling ships that he could detain almost anyone, anywhere, for any reason. Miner turned against miner. It made far more sense to gain points with the local authorities than to try rebelling against them. steve mcloud only wanted to warp away from the station where he'd just undocked. He couldn't even do that without getting grilled by Kalorned. steve needed to get permission to travel. steve protested that he merely wanted to use some station services that weren't available at his home base. Was Kalorned persuaded? Before steve could find out, Kalorned suddenly excused himself. For the unlicensed carebear, the threat of death was always felt, always real. One could feel its presence at every moment. Such was life in Gelhan under the New Order. Did he molest his kid before ganking him with a shotgun? This semi-literate 'Klown' miner deserved everything he had coming to him. Excellent work dealing with mrm and friends. Are there enough of Jamey's CHODE. slaves to engage in the level of terrorism Gelhan is experiencing across ALL high-sec systems? I think not. They stick to little Gelhan primarily to "create content" for Jamey's little blog here. The pattern they follow is that each Agent has a set number of systems to patrol for as long as there is a high amount of mining activity to gank. This is why it's a good idea to have many systems on a list to go to instead of one convenient watering hole. You're both retarded and have no clue what you speak of. Gankers work every system in highsec. Yes even the islands. If you think your system is not being monitored, just post up here with your main and we'll make sure it happens at our leisure.